This would not have been possible without the Bayh-Dole Act. Before the Bayh-Dole Act, the NIH and NSF operated IPA programs that permitted universities to take ownership of inventions made with agency support. Those programs were shut down as ineffective. Bayh-Dole was drafted by the same folks who did the IPA program, and introduced as legislation the year after the IPAs went down. Everything AUTM attributes to Bayh-Dole was done and could have been done under an IPA program. Moreover, the Kennedy and Nixon executive branch patent policies provided for contractors to own inventions, subject to federal agency approval for those contractors that didn’t have an existing commercial position–such as universities. So even without an IPA program (with its own subterfuges and end-runs), universities could deal in patent monopolies if they really wanted to. Furthermore, prior to Bayh-Dole and outside of the IPA programs, drugs and vaccines were developed with federal support but not by means of a university-brokered trade in patent monopolies. The Salk vaccine for polio, for instance. Or drugs to treat childhood leukemia. AUTM recites a fake history, fake outcomes, calls it a success, attributes it all to Bayh-Dole. Pretty cool move. Do you see any Bayh-Dole effect? How about patents held by universities? Bayh-Dole hits around the “6” mark. 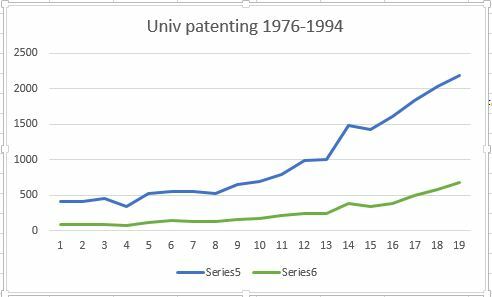 Series 5 is all university utility patents. Series 6 is those patents citing federal funding. The effect just jumps out at us, doesn’t it? If anything, the long-run trend is that universities have tended to acquire more patents on non-federally supported inventions, even as federal funding has become a much greater share of university research support. What’s with that? But staring out at us from this graph is that unlike federal patenting, where before Bayh-Dole most federally owned inventions were available for public use immediately and often royalty-free, those university-owned patents are almost all held behind a patent monopoly paywall and are not available for anyone’s use. For the most part, only those willing to take an exclusive license to commercialize have an opportunity for access. (Yes, the NSF does have a work-around to Bayh-Dole for consortium inventions, and the NIH pleads with universities to find it in their hearts to make research tools available non-exclusively.) So this graph represents the growth in inventions delayed from public access for up to twenty years so that university administrators can seek out a few lucrative deals that otherwise they would not have a financial stake in. We also noted that, to date, most of the revenues generated by the universities came from a small number of inventions. During our visits to the universities (as discussed in apps. VI through XV), we found that the bulk of the revenues was generated by a relatively small number of inventions. Most universities get a least three-fourths of their royalty income from one or two inventions, but JHU officials said they have not had a “big hit” yet. MIT could not determine what percent of this income was derived from federally funded inventions. According to TLO’s Director, about 90 percent of the money MIT receives in licensing royalties each year comes from about 10 percent of its licenses. And so on. The universities sit on a pile of patents, make most of their money from a very few licenses, and everything else is roadkill. The numbers–all the inventions, patents, licenses, startups–represent waste effort. While the claimed effort is that university administrative involvement is necessary for inventions to get developed into products, and without products there can be no use, and without use no public benefit, and without public benefit, why federal research “investments” are wasted–it’s actually the case that things go the other way. The administrators, by putting tens of thousands of research inventions behind patent paywalls, waste research opportunities for collaboration, for use, and from widespread use the impetus for development, for standards, for greater investment by industry. Almost anything by way of a brilliant research discovery can be put to use without university bureaucrats, without patents, or with patents without a monopoly position held by a single commercial entity, or if with such a position without encumbering all the claims within a given patent, or even if so, only encumbering all those claims for only time enough for the licensee to choose what they will develop and freeing all the rest. In the case of inventions in medicinal chemistry, a single patent (or a patent family of continuations, divisionals, and continuations in part) may claim thousands of molecules, multiple methods of making these molecules and others like them, and multiple applications of the molecules, multiple means of delivering the molecules, and combinations of the claimed molecules with other molecules. A drug company might pick on molecule, one method, one application for its investment. But the rest of the invention remains off limits, behind a patent monopoly paywall created by a deal between a university administrator and a company. Thus, we might observe that whatever “successes” there have been with faculty-led research resulting in commercial products in biotech and pharma, there’s still no indication that Bayh-Dole had anything to do with the “success”–the “success” would have happened without the involvement of university bureaucrats. Niels Reimers claimed as much for the Cohen-Boyer gene-splicing patents–that the techniques would have been used anyway, without the patents. The patents may have played an important role (I would argue so, at least), but not to enable use or commercial development but rather to delay the formation of proprietary positions that would block improvement of the techniques from general access. And this may be a general observation for group innovation: use proprietary positions to delay independent proprietary positions that would disrupt the formation of a viable cumulative technology platform. Once that platform exists, then standards may be formed from essential pieces, and people can compete for proprietary positions in applications that interface with the standard or build on it in non-essential ways. If all proprietary positions are suppressed, we get a weird form of communism. If all proprietary positions are encouraged, a nascent technology fragments into institutional pieces and the only remedy is to forget it and move on for two decades when the patents begin to expire. resulting in a commercial product with public benefits on reasonable rather than monopolistic terms, with the patent licensed to promote use and free competition because these are the conditions Bayh-Dole purports to impose on the patent rights to any such invention. But even that’s a stretch. If this happens at all, it happens less than 1 time in 1,000. That’s the University of California estimate. But university officials do it the other way round. They claim everything and try to find an exclusive licensee that will go it alone, regardless of the other options available for broad use and development that, say, follows on use. University officials cannot bring themselves to offer as a default any invention on royalty-free terms to everyone who shows up. Patent monopoly paywalls run by institutional bureaucracies are in the public interest, and everything else isn’t. And all of this they say is the result of Bayh-Dole. They couldn’t act in the public interest without Bayh-Dole. That’s AUTM’s argument. To them, it’s rather a reverse funnel–Bayh-Dole is the tornado that sweeps up all inventions wherever federal funding touches down, and it is the role of university administrators to extract inventions from the dark cloud and place it somewhere over the rainbow as a patent monopoly. I don’t have any problem with university folks assisting anyone who asks in managing inventions. There are ways to get involved that make a lot of sense. I don’t have any problem using the patent system along the way. I am not about to argue that we would be better off with no patents at all or that there is never a time to consider an exclusive license. I can even see the point that the federal government claiming inventions disenfranchises inventors, and in some cases that’s great and in other cases, it’s screwy. And I don’t think for a moment government lawyers and university bureaucrats coming to some arbitrary arrangement over ownership of inventions made with federal support–so that inventors are uniformly disenfranchised–have any chance of creating a workable practice in support of, well, most anything. But it’s even more than a stretch. University officials don’t comply with large swaths of Bayh-Dole and federal agencies don’t enforce Bayh-Dole’s standard patent rights clause. Heck, even NIST’s standard patent rights clause operates outside Bayh-Dole in a number of places–in defiance of Bayh-Dole. Whatever it is that universities are doing with inventions, it cannot possibly be because of Bayh-Dole. They don’t comply, what they claim as success would have happened without the intrusion of university bureaucrats, and they don’t want anyone looking at the horrible damage they are causing for all the federal research that does go to waste behind university patent paywalls that no one ever cares to pay to acquire. Most of that research would not form commercial products–but it would provide a spark for research collaboration, a motivation to send visitors to labs to learn techniques, an opportunity for rapid uptake and assessment, multiple sources of support for improvements contributed to a cumulative technology platform, professional and industry uses relieved of a demand to develop a royalty-bearing commercial product or risk retaining any license at all. this is the success that could not happen without Bayh-Dole. AUTM’s account of Bayh-Dole is an expert cheat. Go ahead, read AUTM’s account of Bayh-Dole and delude yourself. That’s what AUTM wants you to do. Your willingness to be deluded is all they have to work with. This entry was posted in Bayh-Dole, Bozonet and tagged AUTM, Bayh-Dole, cheat, fake history, GAO. Bookmark the permalink.